For the nth year in a row, Carol and I went to the Vermont Brewers’ Festival in Burlington, VT. Every year we like to attend on Saturday, enjoy the festival, and then explore downtown Burlington a bit, and then find a new place to try to eat. This year, we settled on Pho Hong. I’ve always loved Vietnamese food, but it’s one of the hardest cuisines for me to indulge in. From my house in Grantham, I can draw an approximate 60 mile radius circle without enclosing a single Vietnamese place. The nearest is in Manchester (Golden Bowl, which I’ve reviewed here). 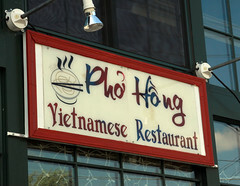 But I’m always looking for new places, and sometime in 2008 Pho Hong appeared, making it the third Vietnamese place in the Burlington area, and (I believe) the first in the actual city. Located on the north side of town in what appears to be an old bus terminal (much of the ambiance of which is preserved in the laundromat next door), it’s in a fairly industrial space, but I’m kinda used to that from Southeastern Asian places (my favorite Thai place in St Paul had all the ambiance of an office-supply store). Settling in, I realized that it had been long enough since my last Vietnamese food (March, at Pho Dao in Murieta, CA), I decided to again go back to one of my favorite dishes. While I love Pho, much of the time I instead opt for Bun Cha Gio Thit Nuong, that delicious combination of steamed noodles, charbroiled pork, egg roll, and pickled veggies. 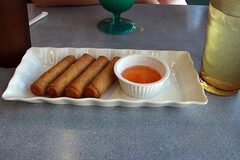 So I ordered up that and some cha giao (Vietnamese egg rolls). The egg rolls themselves I was somewhat disappointed in. Unlike some of the richer, thicker, somewhat meaty rolls I’ve had at many places, my rolls here were thin and barely stuffed. But the spicing was good and the pork taste nice, and the four rolls on the plate made up for some of the lack of heft. My Bun Cha Gio Thit Nuong, however, was quite tasty. they did a good job with it, with a really nice sear on the the pork, decent crisp on the egg roll, and nicely soft-pickled veggies. 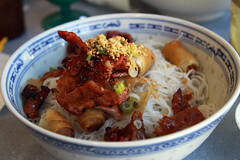 The nuoc cham nicely complimented both the pork and the egg roll, making for a nice overall balance of flavor. The dish was also nicely layered, one of my pet peeves of some Vietnamese places is that they just toss a bunch of stuff in a bowl. Pho Hong nicely builds up the dish. Carol opted for Hu Tieu Mi Bo Vien, white and yellow noodles with beef balls, which was basically Pho with more varied noodles, making for a nice change on the theme. So, I think Burlington does indeed have another worthy Vietnamese dining destination. I’m sure this place is popular with the laundromat crowd from next door…. Good stuff Mr. Kaszeta! You're making me crave Vietnamese food now. I have friends that don't care for the texture of bo vien but I like it a lot. Glad to see you still traveling. I might get a chance to go to Philly next month but crossing my fingers. On weekend and vacation mornings, I really enjoy relaxing with a cup of coffee and the newspaper, and have a nice sweet breakfast, such as pancakes, waffles, or maybe a sweetroll or something. Unfortunately, this sort of thing can be a little difficult when you happen to be in New York City. Luckily, about 18 months ago my sister-in-law introduced me to Le Pain Quotidien (“The Daily Bread”).